A group of refugees disembark from an inflatable boat after reaching the Greek island of Lesvos (30 September 2015). At least 15 people have died and some 38 others are missing in five incidents involving smuggler boats carrying hundreds of refugees and migrants by sea between Turkey and the Greek islands, according to the United Nations refugee agency. “We have warned for weeks that an already bad situation could get even worse if desperate refugees and migrants must continue to resort to smugglers who send them out to sea despite the worsening weather,” said the Office of the UN High Commissioner for Refugees (UNHCR) Senior Operations Coordinator for Greece Alessandra Morelli. “Our fears are now being realized. Nearly every day now we are seeing children, parents, the elderly and the young dying as they try to reach Europe,” she added. In the most serious incident reported this week, a boat that passengers said had been carrying at least 300 people sank in gale-force winds off Lesvos Wednesday evening. The Greek Coast Guard reported it rescued 242 people from the stricken vessel and authorities confirmed seven deaths. At least 15 children suffering from serious hypothermia were admitted to island hospitals. There is now an urgent need for strengthening of the search and rescue capacity in the area, said Ms. Morelli. A meeting of States affected by the current refugee and migrant flow through Greece and the Western Balkans on Sunday called for boosting the Poseidon Sea Joint Operation in the eastern Aegean and specifically the presence of Frontex, the European Union’s agency for external borders. UNHCR has consistently urged governments to increase legal pathways for refugees to reach Europe, said Ms. Morelli, as well as to include more resettlement; expanded family reunification programs; private sponsorship schemes; and more flexible visa policies for students and workers. So far this year, 570,000 people have arrived in the Greek islands from Turkey, most of them on small rubber dinghies in which smugglers cram 50 or more people at a cost of between 1,100 and 1,400 euros each. Refugees have recently reported that smugglers are offering ‘discounts’ of up to 50 per cent to make the voyage aboard the rubber dinghies in bad weather. According to UNHCR, as the weather steadily worsens, newly arrived refugees report that the smugglers in Turkey are now searching for larger boats such as the one that sank Wednesday that can carry hundreds of people and for which they can charge between 1,800 and 2,500 euros per passenger. 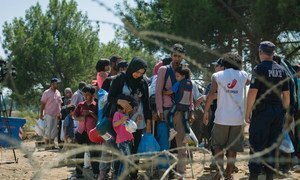 As European leaders met this week to hammer out a 17-point plan of action on the Western Balkans migration route for refugees and migrants fleeing Syria and other strife-torn regions, the United Nations High Commissioner for Refugees commended the fact that a consensus had been reached.